Let me start by saying that I have not read the well-known book by Emma Donoghue that this film is based on. From what I know from talking with someone who has read it (thanks Mum) the narration comes solely from the perspective of the child Jack and for quite a while the reader is kept in the dark about what is really going on because the voice of this character doesn't allow for clarity. The film does not have a big reveal such as this and that may be a problem for lovers of the book. However, the screenplay (written by the author) does include internal narrative from Jack which gives a sense of that voice from the novel and seems a good compromise. 'Room' is about a young woman named Joy who is kidnapped and imprisoned in her captor's garden shed. She is repeatedly raped and has a child as a result of this. When the film opens it is the child - Jack's - fifth birthday. Wanting to protect her son, Joy tells him that there is nothing beyond the room in which they live. The people on television are not real and the only other person they have contact with - Old Nick - is a mystery to the boy. When Old Nick (the captor) cuts off the power after an altercation, Joy begins to plan how she might use Jack as a means to escape. First she has to convince Jack that there is more to the world than he knows. This is rich territory but it is skipped over all too quickly in order to progress the film. Without giving away everything, the pair do manage to escape and the second half of the film is about how they adjust to the outside world. This was an interesting film primarily due to the concept. The first half is tense and reasonably gripping and Jacob Tremblay is compelling as Jack, a child with a rich imagination. The lack of space is conveyed well by director Lenny Abrahamson with the skylight as the only window to the outside. The second half of the story is more character driven and Brie Larson portrays Joy's trauma quite well. However, overall it feels a bit as though there is a genre switch at the midpoint of the film and I wasn't sure this worked as well on screen as it would have done in the book. As a consequence, the film felt as though it petered out as it reached its conclusion. 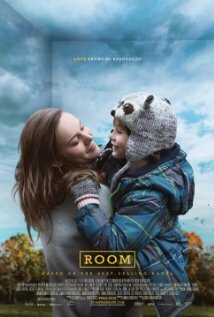 While 'Room' is not a bad film and it has compelling and touching moments, I can't help but feel the story itself was better suited to book form.